My brother bought me this new amazing water bottle that also works as a blender with a magic little spinning ball inside. It’s ideal for making protein shakes and meal replacement shakes on the go when you don’t have a real blender. Getting the proper nutrition is sometimes challenging when I don’t have a lot of time to eat between school and training. I don’t want to eat something heavy and then train right away but I certainly need some energy. I tend to eat several small meals a day instead of three large ones but I always have a good substantial breakfast. Packing healthy snacks for the car is so important. 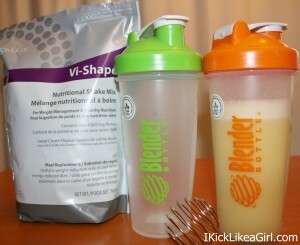 I love the meal replacement shakes by Visalus. I don’t use them as a weight loss program they way they are intended for, but I drink 1-2 shakes a day to make sure I’m getting the balance of all the necessary vegetables and protein. It’s also very important to have a protein right after a hard work out to rebuild your muscles for a faster recovery. These shaker bottles make drinking the shakes so much easier since the little ball really does take all the clumps away.